Dull days of winter getting you down? 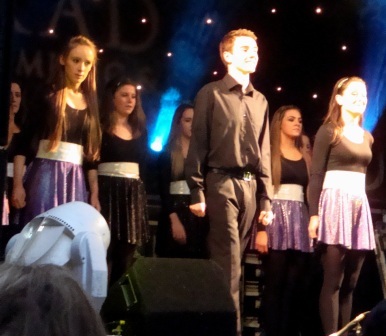 Dublin has a remedy called Trad Fest – a celebration of Irish music and dance. Well, maybe not all Irish. 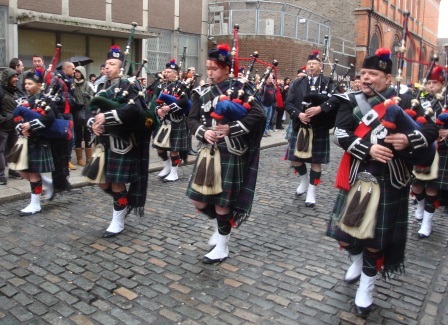 Just 5 minutes off the bus from Galway as I entered the Temple Bar area I was greeted by a Scottish Pipe Band. Where’s a gust of wind when you need one. 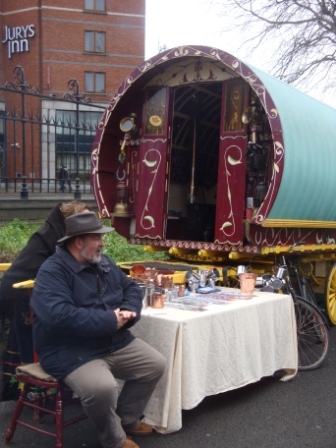 My next stop was a thatched cottage village in the grounds of Christchurch Cathedral where you could glimpse the days of old, from a poitín still to soda bread making to tin cups and accessories still for sale by traveling merchants, and a petting zoo for children. As I wandered the cobblestones, I came upon a stage of Irish Dancers. Again, with a twist. The first troop were dressed in pink American cowgirl outfits, performing Irish dance to American country music. The young ones are always the most adorable. They were followed by an assortment of other groups from around the country from the young to veteran champions. Time was moving on and I needed to head over to the Arlington Hotel in Temple Bar for some Irish dance lessons. The brochure didn’t specify which type of dance they would be teaching, but I was game for anything. A young man named Cian played and sang a few tunes while we waited for the appropriate ‘Irish time’ to begin (or more accurately, for the stragglers to arrive). He informed us that Sue, our instructor, would be teaching us some reels. Although it was coming on two years since I’d done any céilí dancing, it all came back quickly. They had a well designed program with dance instruction broken up by tunes from Cian and solo dances in the Riverdance-style from Sue to keep us from overheating. 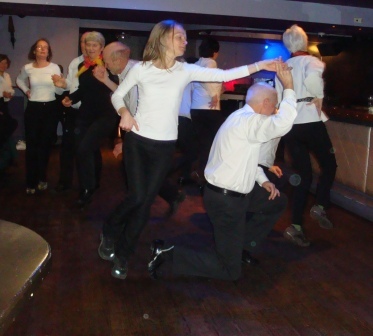 Céilí dancing is an aerobic exercise – one of the only fun ones (IMHO). After our first reel, a group of dancers from near Oslo, Norway entertained us with one of their traditional dances. So far, everything I’d seen had been free. If you’re short of cash after the holidays, the abundance of free entertainment available should give your spirits a boost. 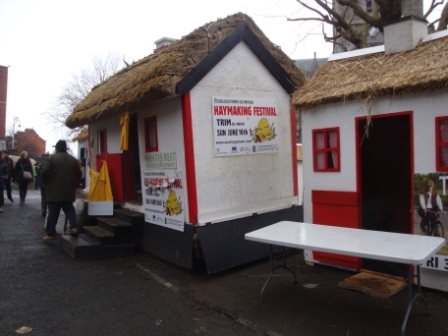 There were two outdoor stages, for those like me that are uncomfortable hanging out in a pub by themselves, but if that doesn’t bother you, there were over a dozen venues to visit for plenty of free entertainment including a pub crawl. 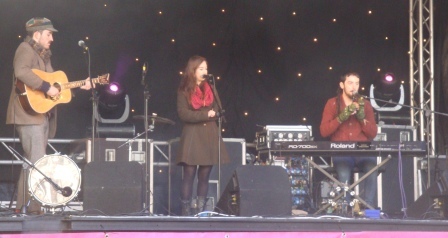 In case you looking for a bit more variety, I even caught a blues set by Mary Coughlin and band. 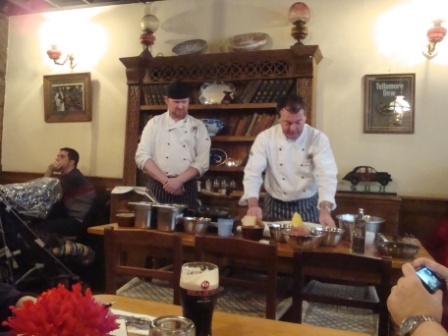 If that wasn’t enough, there was even a taste of Irish food at Gallaghers Boxty House where they were holding demonstrations of how to make the pancake, bread, and dumpling boxty, complete with taste testing. 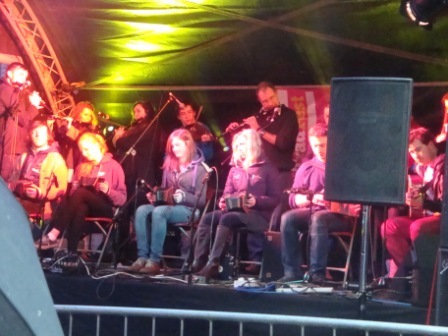 There was certainly something for everyone at Temple Bar Trad Fest. Be sure to check it out next year. sooo….??? 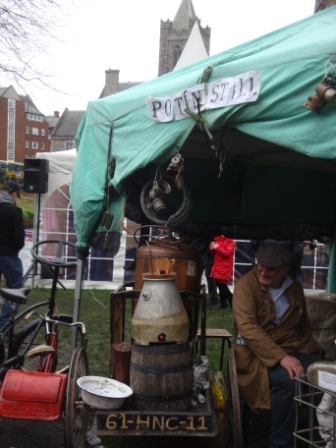 did you try the Poitín? and had to wonder if that sudden breeze came about you mentioned? hahahha! d’fhéach sé mar a bhí sé i bhfad níos craic! aye?